We stumbled onto Bookworm on the iPad and did not realize until much later it is a game that was played long before the iPad came out. I think it is a very productive game for children to play. If it is not, I have wasted at least 30 hours of my life. Even if it was not a good, education iPad app, we still would play it, just not as much. It is a deceptively addictive game. Here’s the deal: The letter tiles on Bookworm, I finally figured out, are random. You take on adjacent tiles to make words. The letters to the word you made disappear and new ones arrive at the top to take their place on the grid. The Scrabble paradigm applies: the bigger the word and the more unusual the letters, the more the points for the word. After a while, you start getting red tiles. If a red tile falls to the bottom, you lose. 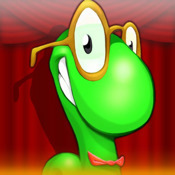 Making bigger words in Bookworm helps keep the red tiles off your back. If you don’t like your tile configuration, you can shake up the tiles and rescramble the words. But there is a cost: more red tiles to fight. My whole family loves the game. I have just one request and I’m not sure it is even possible. For some strange words, Bookworm tells you the definition of the word. But, frankly, my kids spell a lot of words that none of us know. I wish every word came with a definition after you solved the word. It would make the game so much more educational without giving up any of the fun of the game.